There aren’t many vehicles in whole automobile industry that are known and reputed like Toyota’s Hilux pickup truck. This light commercial vehicle is available worldwide and since its introduction in 1968 Toyota has sold more than 16 million units. Toyota Hilux has gained strong reputation thanks to its almost unbreakable built quality. It is one of the top sellers in its class among other rivals such as Ford Ranger, Mazda BT-50, Nissan Navara, Mitsubishi Triton, etc. This model is currently in its eight generation in which it entered in 2016 model year. New generation model has been thoroughly redesigned in all aspects and thanks to that it is ready to roll for a few model years. Its new stylish and premium design sets the standards in its class. New interior is refined and better equipped while exterior is modern and attractive. It also offers wide range of engines and new generation model has introduced new turbodiesel unit and new transmission. The engine offer depends on market and model is also available in wide range of configurations and equipment groups. So, being redesigned for the last model year, 2017 Toyota Hilux will continue almost unchanged except some equipment juggling and electronics upgrades are possible. In the engine department, the new 2017 Toyota Hilux will likely offer the same engines available in the current version. Engine offer will depend on the market where the model will be sold but variety of diesel and petrol engines will be available. In diesel group we should expect two options. One diesel engine is a 2.8 liter turbo four which will deliver around 174 hp and torque of 331 pound-feet. Smaller alternative will be a 2.4 liter turbodiesel which will produce around 160 hp and max torque will hit 295 pound-feet. Gasoline powered models will include a 2.7 liter four-cylinder engine capable to produce around 164 hp and Toyota may again offer a 4.0 liter V-6 which can deliver 278 hp. The engines will be combined with two transmissions. The standard will be a six-speed manual shifter which has been equipped with truck-tuned rev-matching technology and alternative will be automatic transmission with six gears. The base Workmate models will also include five speed manual option. Toyota Hilux will be available in either two- or four wheels drive configurations. The new Hilux model will be planted on the fully boxed frame which has been strengthened for the last model year with fully boxed rails and beefier cross members. Suspension has also been improved with new shock absorbers and leaf sprig at the rear side. Thanks to that new model will not need new improvements in this aspect and it will continue to deliver one of the smoothest rides in its class in either off-road or on-road adventures. Thanks to its short overhangs and long wheel base and also good approach and departure angles it will also be ready for tough terrains. As for its main purpose, towing and hauling, it will allow up to 3, 500 kg of max towing and up to 1240 kg of payload capacity. When it comes to the exterior design of the new 2017 Toyota Hilux considering that last model year has brought obvious new-generation changes it isn’t expected that new model will introduce new moments. The model already has modern, premium look which is up to date with Toyota’s new design strategy and therefore it will carry on almost unchanged. However, it is possible that Toyota will offer new color options and new set of wheels. The model will continue to exploit the same grille design and headlights from the current version and taillights will also come in the current form. It will ride on 17- or 18-inch wheels in most configurations and depending on the trim it will be available with some features like side steps, sports bars, chrome inserts, etc. The model will also continue unchanged in terms of dimensions. As for interior of this model, it has also been renewed for the 2016 new-generation year and new model won’t experience big modifications here either. New-generation interior is neat, well-arranged and with higher-quality finishes. Dash is thin, with ergonomic controls and contrasting trim. Multifunctional, steering wheels looks nice and includes chrome inserts. Model also includes clever storage compartments for your needs. Four-door models will have rear seat with split folding functionality which will allow you to configure rear seat space according to your needs. Like other big names in pickup truck industry, new Hilux model will be available in variety of configurations and equipment levels. It will come in Cab on chassis form for those who want to choose their type of tray. Models will also be available in three cab forms including Single Cabs with two doors and four doors Extra and Extended Cabs. On Extended Cabs back doors are rear hinged. As for trims the same strategy is expected to be used while some equipment regrouping is possible. Trim range will start from basic Workmate versions and then will come SR, SR5 and SR5+ models. Workmate models will come with 16- and 17-inch wheels, and with a 6.1 inch touch screen, air-conditioning, vinyl upholstery and so on. On other trims 7-inch screen based infotainment system will be available, more speakers, connectivity options, seat adjustment and so on. Higher spec models will also include leather upholstery, navigation, power adjustable seats, driver’s information display and so on. In terms of safety all models will include traction control, downhill assist, hill-start control, airbags, etc. Higher trims will bring Safety Sense package which adds road sight assist, emergency braking and lane departure warning. Full and more precise equipment and trim specification will be available closer to the new model launch date. 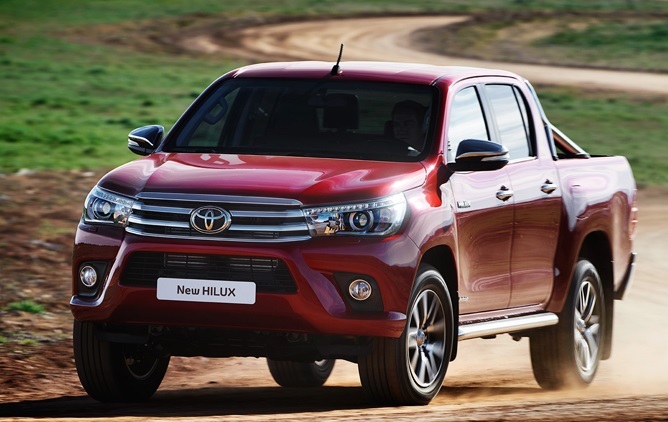 After it was thoroughly redesigned for new generation Toyota Hilux is ready to stay competitive for a few years without of big changes. However, Toyota wouldn’t big so big brand if it wouldn’t surprise us with some unexpected changes. So, it is possible that new trim or special edition model will be introduced. On the other hand the new 2017 Toyota Hilux is expected to come in the first half of the 2017 and price will stay close to the current boundaries.